The Tidewater Community College students didn’t know what to expect behind the closed door at Eastern Virginia Medical School. Each team of nursing, radiography and medical laboratory technology students knew a patient was inside but didn’t know why. 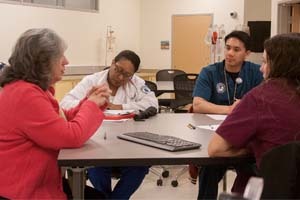 The “real-world” scenario provided ideal training for 36 students from nursing and the Allied Health professions to learn by doing while faculty watched their decision-making in a nearby observation room. For two days in March, students in teams of three encountered an unfolding simulation scenario involving a stroke patient and his wife, both standardized patient “actors” employed by EVMS. The students started in a scenario that mimicked an emergency room, then moved to intensive care and finished with preparing for discharge. An added twist: The patient and his wife were both of Jamaican descent, which gave the student teams an opportunity to learn the significance of picking up cultural cues when providing care. 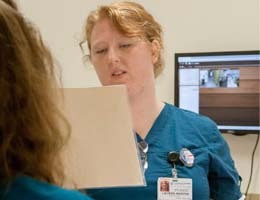 “Being able to be prepared for what you will encounter every day by learning in a stress-free environment was an invaluable experience,” said radiography student Tara McGovern. The experiential learning sessions were made possible thanks to a sponsored program by the Association of American Colleges and Universities: Bringing Theory to Practice project. The EVMS program was a collaborative project between TCC’s Office for Intercultural Learning and Kim Curry-Lourenco to support student learning by advancing the psycho-social wellbeing of students and actively involving them beyond the classroom. being respectful about cultural differences can include simply asking about what you don’t understand. “It’s empowering to the patient to be asked questions about their culture,” said Taylor Ward, a medical laboratory student. 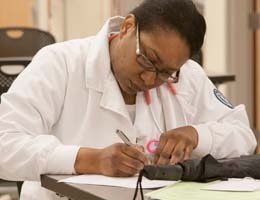 “It was great to be with some of my classmates who are in the same field,” said nursing student LaKeshia Eley. The project’s long-term goal is to impact student learning by supporting a learning environment that provides TCC students with the knowledge, skills and attitudes necessary to appreciate the interconnectedness of varying cultures.